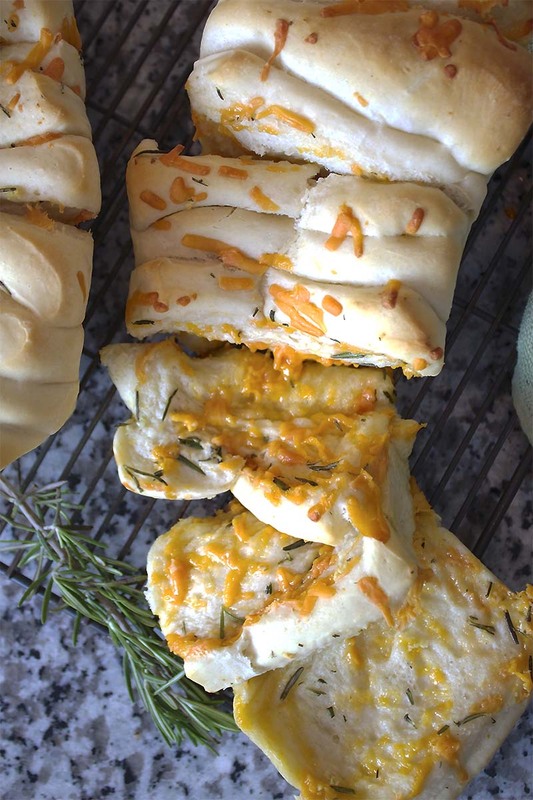 Cheese, rosemary and garlic create a perfect savory alternative to the traditional pull apart bread. Experiment with different herbs and cheeses to create your own favorite! In mixing bowl, combine the yeast and 1 tsp sugar and mix in the warm water. Let it set for 5 minutes until it's foamy. With spoon or dough whisk, mix in the milk, ¼ cup sugar, butter and 3 cups bread flour. Place bowl on mixer and mix with dough hook until smooth, about 3 minutes. Continue adding enough of the remaining flour until the dough forms into a smooth ball and no longer sticks to the side of the bowl. Knead for 5-7 minutes. Place the dough in a lightly greased bowl and let rise in a warm spot until doubled in size, about 1 hour. Remove the dough from the bowl and roll out into a large rectangle, 10 x 20-inches and about ½ inch thick. Combine the butter and garlic and spread over the bread. Sprinkle with the cheese and rosemary. Cut the dough into 5 strips from the short side of the dough. Stack each strip onto the other to make a tall stack. Cut the stack into four squares. Place two stacks horizontally into a greased bread pan. Repeat with the remaining dough in another pan. Cover and let rise for about 30-40 minutes. Bake at 350°F for 35-40 minutes. Remove from oven. 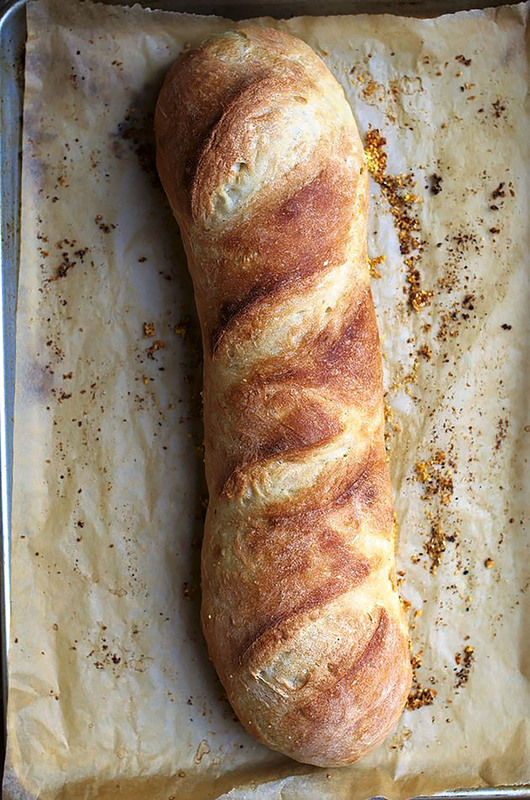 Remove the bread from the pans and let cool on a wire rack. Recipe created for Red Star Yeast by Thyme In Our Kitchen.